Gone Girl is gone no more! 20th Century Fox has announced to the press last Friday that the film will be released in Malaysia on December 11th. It was supposed to be released here last month but it was cancelled due to the excessive censorship cuts required by the local film censorship board. It is assumed that Fox now has a way to censor the film without affecting the viewing experience too much (like blacking out the screen or just mosaic hopefully, instead of chopping the scenes off). UPDATE: Click here to read about how the film is censored in Malaysia. Currently Certified Fresh on Rotten Tomatoes with 88% positive reviews (out of 247), Gone Girl is critically considered as one of top films directed by David Fincher (The Social Network, Fight Club, Zodiac) with strong a performance by Ben Affleck (Argo, Runner, Runner, The Town, Good Will Hunting) and Rosamund Pike (The World’s End, Jack Reacher, Die Another Day). The story is about a man who becomes a suspect of the disappearance of his wife after the media has turned the spotlight on him. My film review on Gone Girl is now available. To view it, click here. 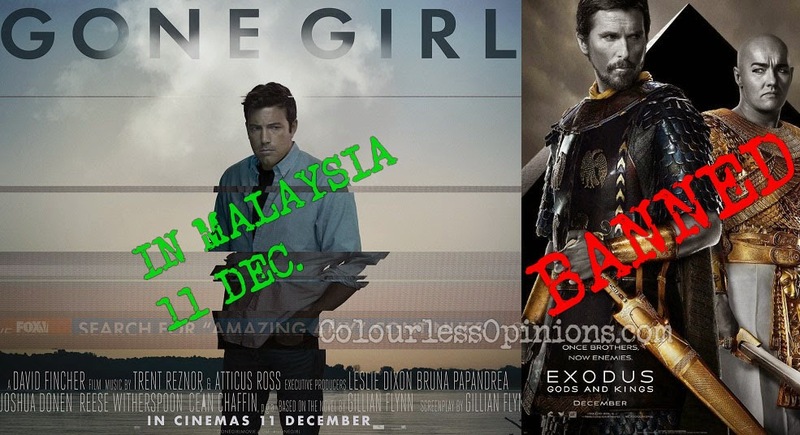 I was told that Gone Girl is actually replacing the release of Exodus: Gods and Kings on that week as the film may have been banned from being released in Malaysia. Although this was not officially announced, it wouldn’t be a surprise anyway considering how Noah was banned earlier this year for its fictional depiction of the titular prophet. Directed and co-written by Ridley Scott (Prometheus, Gladiator, Alien, Blade Runner), Exodus: Gods and Kings is an upcoming biblical epic film that stars Christian Bale (popularly known for Batman in Christopher Nolan’s Dark Knight trilogy) as Moses, the prophet who leads the exodus of slaved Hebrews from Egypt and the Pharaoh, Ramesses II, played by Joel Edgerton (The Great Gatsby, Zero Dark Thirty). Film also features Aaron Paul (Need For Speed, Breaking Bad TV series), Ben Kingsley (Iron Man 3, Schindler’s List, Gandhi) and Sigourney Weaver (Cabin in the Woods, Ghostbusters, Alien films) for the supporting roles.